Some people exhibit conditions of hyper-recruitment and decruitment, possibly in addition to normal recruitment hearing. I, personally, have all four different kinds of hearing in separate frequency ranges: normal hearing in the bass region, normal recruitment beginning around 750 Hz and extending up to around 4 kHz, hyper-recruitment in a narrow band at 1.8 kHz, and decruitment above 4 kHz. Hyper-recruitment is the condition that sounds grow louder too quickly, compared to normal recruitment, often growing uncomfortably loud above some presentation level. Decruitment is the opposite condition, where sounds never manage to grow quite loud enough, no matter how loud you make the presentation. There seem to be no direct diagnostic tests for these variations, but indirect evidence for them comes from the audiologist indicating that you have a reduced maximum comfortable level, in the case of hyper-recruitment. You can find them for yourself by carefully listening as you go up the chromatic scale. 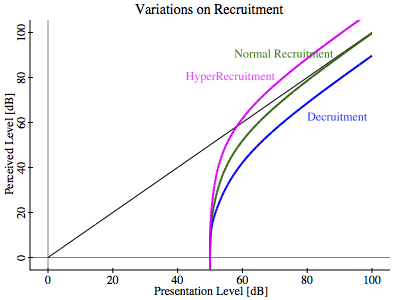 Hyper-recruitment is often found when people have deep notches in their hearing. The overly sensitive frequency range is just above that notch pitch. In my case, when running up the chromatic scale on a piano, my left ear suddenly ceases to hear anything at all in a narrow range from C6-F6, two octaves above middle-C (C4). No matter how much I crank up the amplifier I simply can’t hear anything at all in that range. That dead zone is around 1.3 kHz, and by the time I reach 1.8 kHz I run into overly sensitive hearing, or hyper-recruitment. My hearing goes back into normal recruitment above 2 kHz, until I reach the zone above 4 kHz and beyond. There, I can tell when listening to music, that the highs are never quite loud enough, even when listening through Crescendo. That’s my zone of decruitment hearing. Many people will never have to contend with these variations, and a plain old Crescendo will be all they ever need. But for those of us with these additional problems, is there anything that can be done? There is, but it becomes a process of trial and error with an equalizer placed just ahead of Crescendo. There are no quantifying tests to diagnose at what frequency, nor by how much, you have hyper-recruitment or decruitment. But my physics shows that indeed, the same kinds of Crescendo corrections work perfectly well when preceded by EQ cut for hyper-recruitment, or EQ boost for decruitment. 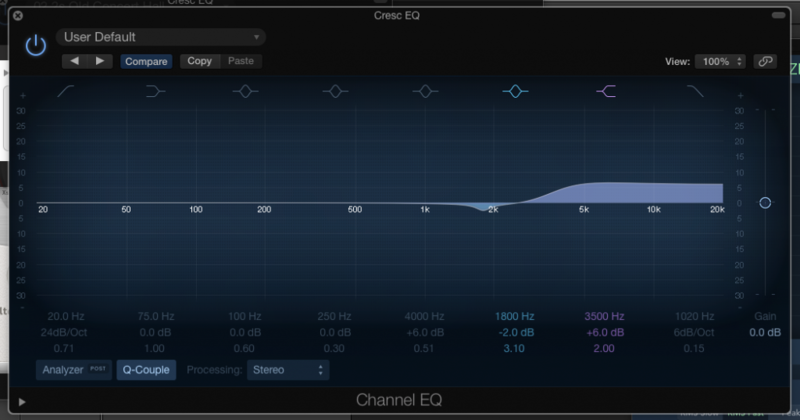 And with this kind of EQ, for me, the results are absolutely magical. The hyper-recruitment cut is hardly anything, but without it I hear a crunchy sort of sound during high strings or female chorus sections. It sounds like walking on loose gravel. But with a mere 2 dB cut at 1.8 kHz that crunchy sound completely disappears. And without the EQ shelving boost above 4 kHz, I never seem to be able to hear the highest violins and the “air” above. But with only 6 dB of boost, I completely hear all of it. Mind you, by the time we reach 4 kHz, my threshold elevation is rising above 60 dB, reaching as much as 80 dB at 8 kHz. That is on the verge of profound loss at the highest frequencies. Yet, with this arrangement of EQ preceding Crescendo I have proven with a low-cut filter that I am able to hear my wife’s amazing 10 kHz sibilance in her speech. Amazing! And wonderful.